Why Are Bay Windows a Good Choice for Small Rooms? A bay window can allow you to enjoy panoramic views, improve your home’s appearance, and increase a room’s available space. 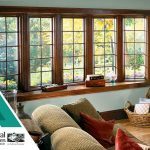 Renewal by Andersen® of Long Island, the leading replacement windows company, can install replacement bay windows for you. Today, we’ll discuss the advantages of bay windows in rooms with minimal floor space.